"This story follows a group of the young and single - children of 60's swingers. They are bedevilled by indecision, choice, tradition, and their parents' marital history. The men can't commit, the girls can't reconcile independence and maternity, the rules seem to be vanishing. And time is passing." 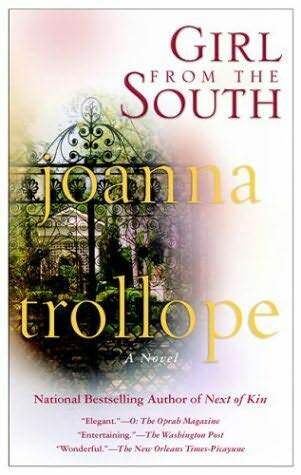 Light-hearted novels by Joanna Trollope such as Marrying The Mistress and A Village Affair have sold in their thousands across the UK and beyond. Ordinarily they constitute perfect reading for tired commutes and beach lounging. But what of one of her lesser-known works, Girl From The South (which is now ten years old)? Attractive for its range of contrasting settings, readers are also perhaps intrigued by the way in which the cast of young Brits and Americans collide, and how their relationships fare as a result. This would appear to be a promising premise, but Trollope lets us down not through the characters or even the premise but thanks to the lack of detail she gives. While it is certainly possible that such non-committal and immature people exist, and that there are people who act as they do, we are not given enough detail as to why this is. The "children of 60s swingers" theme is not played upon nearly strongly enough if the author wanted to include it, and Gillon's background and family history is a complete enigma. Her Southern US heritage is evoked nicely through her family members, but the reasons for her feeling like the "black sheep" of the family are unclear. Readers would benefit more from this novel if Trollope had shed some more light on this. Even though the 'being yourself' element is strong in this novel, the 'finding yourself' strand could have been elaborated on further. Girl From The South is packed full of beautiful descriptions and sage life advice, but a novel cannot be carried on this alone. Empathy is indeed possible thanks to the unrequited love experienced by Tilly and Ashley, but this is as far as it goes. The majority of the other characters seem implausible, forgettable, or just incomprehensible. Although they are human, it often still proves difficult to identify with them. Even when characters are more developed, such as Gillon's parents, the whole effort still feels shallow, superficial, and like it could have gone further (incidentally, the situation in which Gillon's parents find themselves is never fully resolved, and neither is the childhood and youth of Gillon's grandmother Sarah. This lack of resolution was equally disappointing). There is the impression therein that Joanna Trollope "knows" her characters well and yet chooses not to pass this knowledge onto us. So much potential in the plot and characters ultimately comes to nothing, with the settings perhaps being this novel's strongest point. New readers are better off starting off with stronger Trollope classics, such as The Choir, and leaving Girl From The South for the library bargain table.